I think that we can all agree that one of the best flavors in this world is Matcha. If it's Matcha flavored, I love it; Matcha lattes, Matcha cupcakes, various Matcha flavored candy, Matcha hot chocolate, you name it. I add Matcha powder to my milkshakes, smoothies; really anything sweet that can benefit from the flavor of Matcha. So, I had the opportunity to try Matcha flavored KitKats for the first time ever, this past weekend & I FELL IN LOVE. They're even more incredible than I had imagined. And I thought to myself; 'self, these things are amazing, but suuuuper expensive, considering the amount you are getting and the extra cost to have them imported. 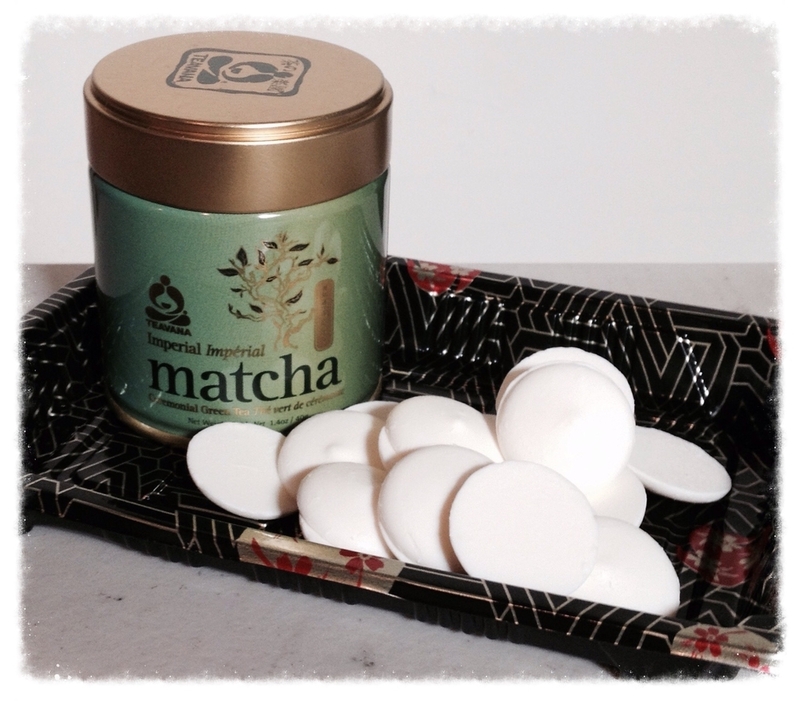 There has to be a more inexpensive way to enjoy Matcha flavored chocolate.' And then it dawned on me; Can't I add Matcha powder to white chocolate? White chocolate is very sweet, but with not much of a strong unique flavor of its own, and Matcha has a very strong flavor, accompanied with a very bitter aftertaste. I felt the two would perfectly compliment each other and join in one delectably heavenly union. So, the very next day, I went out to Teavana to pick up the Matcha powder, followed by AC Moore to grab up some white chocolate melts and cute little candy trays. When I got home, I tossed a bunch of white chocolate melts in a microwaveable bowl and melted that chocolate to a beautiful, silky consistency, then sifted Matcha powder over the melted chocolate. I can't really tell you any measurements, as I live my life eyeballing anything I come into contact with. But I would just say keep adding powder until it has the right flavor for you. Some may like just a hint of Green tea flavor, while others prefer it to pack a punch. It also depends on how large of a batch you are intending to make. So once you have the desired amount of Matcha added, the fun part begins, adding them to a super awesome candy mold! The next step I take is putting the molds into the freezer to set. I am not sure if everybody does this, But I find it works very well for me, and allows the chocolate to set very quickly. (And this works especially well if you only have one mold to work with.) When the chocolate is set, just take it out of the freezer, and let it sit for about two minutes. Place a paper towel down on the table, and turn the mold over on top of it and just use the body heat from your hands over the bottom of the mold to loosen the chocolate. And voila! 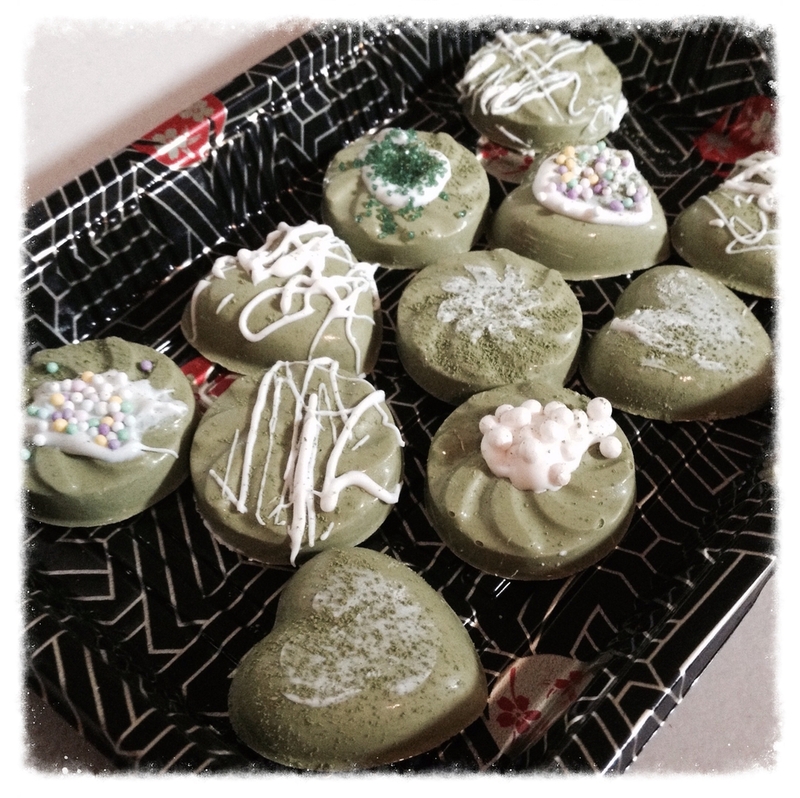 you have delicious, amazing Matcha flavored chocolates to enjoy! Now if you're a minimalist, they are perfect right out of the mold. While others may want to decorate the chocolates to give them a fancier, more enticing look. I'm one of the others!! So I chose from my vast assortment of sprinkles and cake decorations to find the perfect accompaniment for my tiny green delicacies. Then I went to work! They came out beautiful, and as if I picked them up from one of those high end, fancy candy shoppes (okay, maybe they didn't come out that well, but I thought they looked nice!) I decided to give about half of them to my lovely friend Jess, so I packed them up in one of those cute little candy boxes with some tissue paper, and they just looked adorable. So, verdict is, I never need to worry about importing any expensive fancy-schmancy Green tea chocolates from Japan again. I can make my own authentically tasting Matcha chocolate at a fraction of the cost. If you are a fan of the Matcha flavor, please do yourself (and your wallet!) a favor, and try these inexpensive little darlings. You will not be sorry!